RNA-MoIP is an integer programming framework for predicting RNA structures by inserting local 3D motifs. It works with the program MC-Sym to produce a pool of predicted 3D models. 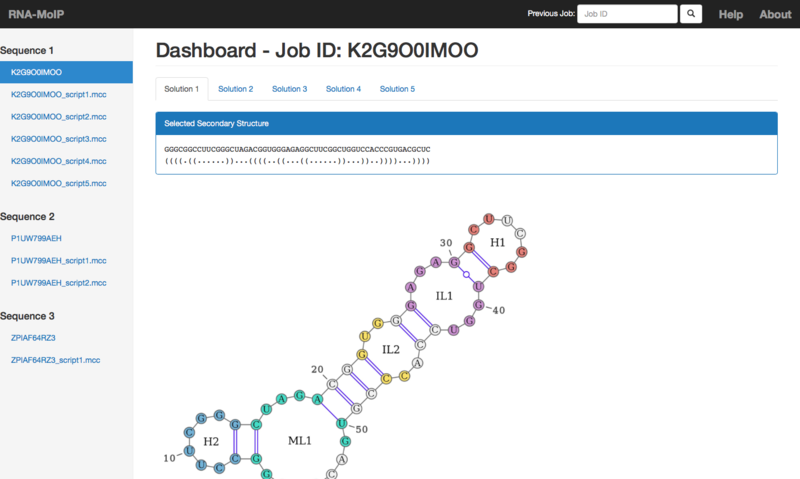 This web server automates the pipeline for processing a primary sequence input to RNA-MoIP to the MC-Sym script, and allows users to visualize the inserted motifs. A description of the RNA-MoIP algorithm can be found in the paper Vladimir Reinharz, François Major, and Jérôme Waldispühl. Towards 3D structure prediction of large RNA molecules: an integer programming framework to insert local 3D motifs in RNA secondary structure. Bioinformatics (Proceedings of ISMB 2012; Also appear in Conference Section), 28(12):i207-14, June 2012. The user enters a sequence (and optional structure) to be processed by RNA-MoIP. RNA-MoIP determines the optimal motif insertions and generates a MC-Sym formatted input script. The user downloads this script and uploads it to the MC-Sym server, which computes a pool of predicted 3D structures. User enters an RNA sequence for processing by RNA-MoIP. Valid symbols are A, C, G and U. The maximum sequence length is 200 nucleotides. A set of RNA sequences entered using the FASTA format. Sequences are delimited with lines beginning with ‘>’, which signifies the description line and is skipped in processing. Sequences uploaded in FASTA format are processed independently and each assigned a seperate working directory and Job ID. Output directories uploaded in the same fasta are linked and can be accessed from any of the working directory Job IDs. Job Name: A job name can optionally be specified. This name is used as an alias for the working directory(ies). Users can either search for their job using the Job name or randomly assigned Job ID. Energy Range Model (default): RNAsubopt is used to generate a pool of RNA secondary structures. All secondary structures within a predefined energy range of the MFE are considered. Users can select an energy range between 0 and 10 kJ/mol (default energy range = 3kJ/mol). Stochastic Model: RNAsubopt is used to generate a pool of RNA secondary structures. A random sample of structures is generated with probabilities from Boltzmann sampling using the partition function. Users can select between 10 and 500 secondary structures to be sampled (default number of structures sampled = 25). Custom Structure List: Users can upload their own structure, or list of structures to be sampled. Structure input only works for single sequence inputs. The Job ID generated by RNA-MoIP for the current run. The dashboard URL can be bookmarked to return to later, or users can search for their job in the top navigation bar using the Job ID or Job Name (if specified). Users can access other working directories for sequences submitted in the same FASTA using the side navigation panel. Quick access to all MC-Sym input scripts is available in submenus for each sequence. An image is generated of the corrected secondary structure and location of inserted motifs. Using the motif description files, non-canonical base pairing interactions are shown using the Leontis-Westof classification scheme. The image is generated by the VARNA Visualization Applet for RNA. A list of motifs inserted by RNA-MoIP and the residues which they occupy. A link to visualize and download the PDB files for each motif allows the user to see the full list of base interactions for each inserted motif. Visualization is completed using jsmol. The MC-Sym input script can be directly uploaded to the MC-Sym web server at http://www.major.iric.ca/MC-Sym/. After downloading the output file, the script can be uploaded and submitted under Option 1 of MC-Sym. Information about script processing can be found in the MC-Sym user guide http://www.major.iric.ca/MC-Pipeline/manual.pdf. Raw output file from RNA-MoIP. Shows the corrected secondary structure, motifs inserted, bases pairs deleted, and the value of the of the objective function for the output. Sample sequences can be set or loaded (pre-loaded working directory) under the Advanced Options menu. MC-Sym is used to predict all-atom RNA tertiary structures from the RNA-MoIP pre-processed scripts. Upon redirection, a working directory is created that is populated by model predictions as they are computed. Structures take the format "structure-XXXX.pdb.gz". It may take some time for models to be computed so results may not appear immeidately. Information about the job can be found in mcsym.out. IMPORTANT: before downloading the models, it is highly recommended to perform minimization. MC-Sym uses fragments for the PDBs that entirely reconstruct the backbone, which often renders it as discontinuous stretches when the structure is viewed. Minimization commands can be found in commands.html. Minimization can only be applied to generated structures, so users should wait until structures have appeared before applying this option. Minimization-Relieve is the fastest setting (recommended). MC-Sym Output: Left: The working directory for MC-Sym. Candidate structures (in red box) appear as they are computed. Right: The commands menu. Users are recommended to perform minimization once sufficient results have been generated.